We can’t – it’s too hard. We can’t – it’s too much. We can’t – we don’t know how. We can find a lot of reasons why we think we can’t do something that’s going to be difficult. But – if God wants it done – there is no “we can’t”. “We can’t’ just doesn’t apply when the Creator of the Universe wants to do something through us. Have we learned that yet? Have I learned that yet? The Israelites obviously hadn’t figured that out yet when the spies came back from the Promised Land and said, “We can’t attack those people, they are stronger than we are.” They didn’t get it. God had said he was going to give them the land, he was going to give them victory. “We can’t” was true but God could. And he promised that he would. Yeah, Caleb! He was so right! Yes, they could certainly do it because God had promised and he always keeps his promises. It’s all about putting feet to our faith, not about having enough strength or enough money or enough time. God enables us to do the things he wants us to do. Do you believe that? So I have to ask myself – are there any ‘I can’ts’ in my life that I need to change to ‘I can’s” because God wants to do it through me? What about you? Any ‘I can’ts’ that God wants you to change? 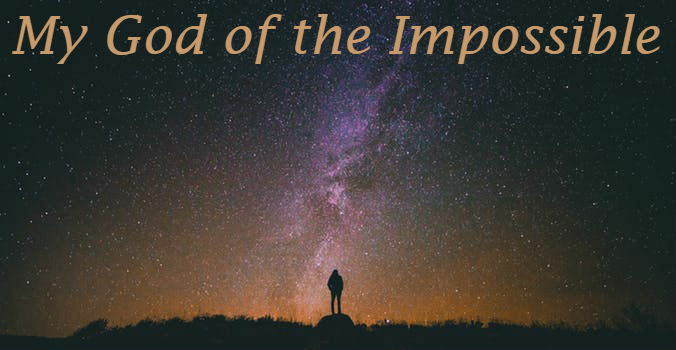 Thank you for being our God of the Impossible, Abba Father.